The Warehouse Laboratory is the first building in the USF System to earn LEED Platinum Certification. (July 23, 2018) – The University of South Florida St. Petersburg’s Warehouse Laboratory, which houses biology, chemistry and physics labs, received LEED Platinum certification from the U.S. Green Building Council. Platinum is the highest and hardest certification to earn from the most widely used green building rating system in the world. Only about 10 to 15 percent of buildings worldwide have earned this pinnacle of distinctions in sustainable design and construction. The Warehouse Laboratory is the first building in the USF System to receive this recognition. “Planning, constructing and operating the first building in the USF System to earn LEED Platinum is another example of our commitment to sustainability at USF St. Petersburg and our drive to be recognized as “Florida’s Green Campus.” It is representative of the sustainable culture we not only teach, but also practice,” said Interim Regional Chancellor Martin Tadlock. This is the fourth building at USF St. Petersburg to earn LEED certification. The Science and Technology building, the University Student Center and Lynn Pippenger Hall all received LEED Gold Certification in recent years. At the site of the now modern Warehouse Laboratory once stood an old Greyhound bus service station, where buses were cleaned and repaired. 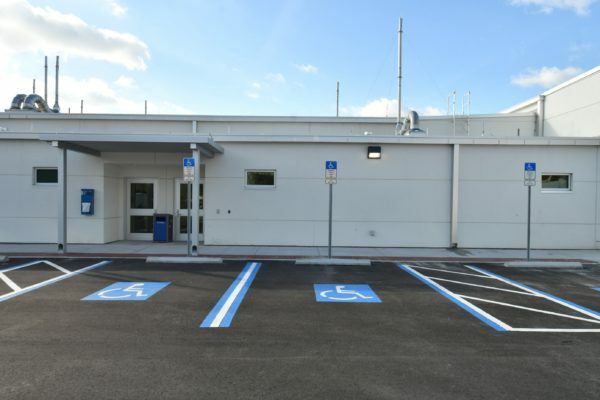 The University acquired the property in 2014 and soon began remodeling the existing structure by adding a new roof, putting in an efficient heating/air system, enhancing insulation throughout the building and improving the external facade. “This project was really suited to earn platinum certification because of the reuse of the building’s entire shell, walls and floor. There was no tear down of the original structure and with that, very little waste involved,” said Josh Kane, LEED Project Manager for the Warehouse Laboratory. 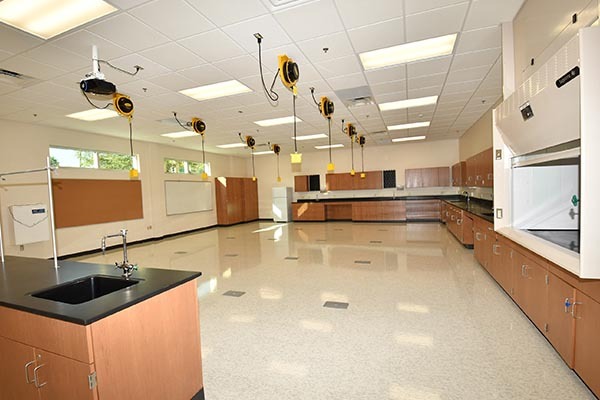 The building totals more than 10,500 square feet and now consists of a fully integrated chemistry lab, two pure biology labs and one lab that can be converted between biology and physics, along with two prep rooms. The labs have been in heavy use since their opening more than a year ago, hosting most of the University’s science classes. The Warehouse Laboratory earned Platinum certification by garnering high scores in several key categories. Because it was a previously developed structure, it ranked high in sustainable sites. Recycling rather than demolishing the Greyhound bus service station and rebuilding new also saved the University $2 million. A 40kw solar carport in the parking lot just north of the labs powers about 15 percent of the building. This earned it elevated marks in energy and atmosphere, while maximizing open spaces and optimizing energy performances grossed high scores in regional priority credits. “Earning Platinum is a huge achievement and a rarity because of the difficulty of earning enough credits and doing so at a low enough cost to make it worthwhile,” said USF St. Petersburg Sustainability Planner Brian Pullen. According to the U.S. Energy Information Administration, commercial and residential buildings account for nearly 40 percent of national energy consumption. LEED provides a framework for healthy, efficient and cost-saving green buildings. Projects pursuing certification earn points for attributes such as energy use and air quality. Based on the number of points earned, a building is given a rating level of Certified, Silver, Gold or Platinum.